Clip'nSave combines several easy-to-use graphics tools into one. The screen capture lets you take a picture of anything on the desktop and automatically save, email or print it. 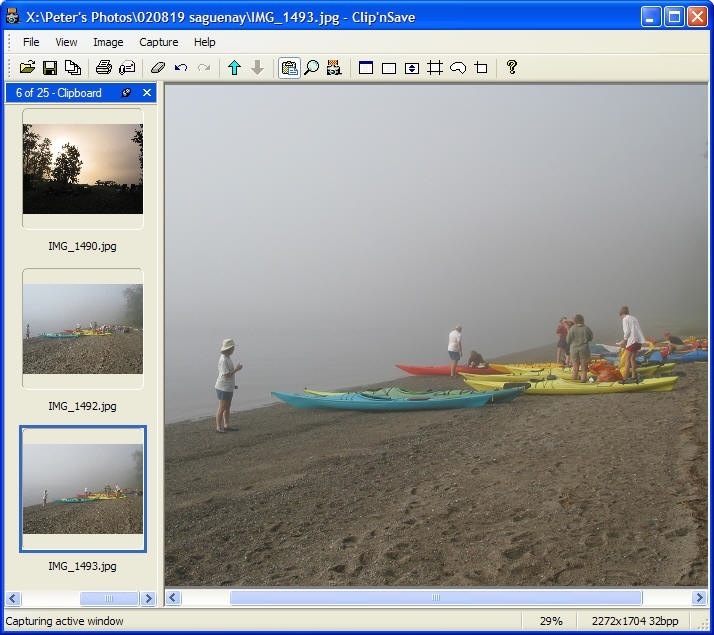 Advanced Capture features include the ability to AutoScroll, so that you can take pictures of, for example, web pages that can't fit on the screen all at once, and the Global Capture Menu, that makes Clip'nSave's capture commands available on every program's Window or System Menu. The Clipboard List adds multiple Clipboards to Windows so you can collect multiple images, or pieces of text and Paste or Drag and Drop them into other programs. With the Batch tool you can change pictures from one format to another, or apply image processing effects to one or many files automatically, without user intervention. Whether file size or image quality is most important, selecting the best file format is easy with Clip'nSave's side-by-side dynamic preview. New, faster and higher quality color reduction, with more user control, greatly simplify preparing your screenshots and photos for the web. Use Clip'nSave to display images files opened in programs like Windows Explorer or Outlook. Using the Associations panel on the Preference dialog, associations may be safely set and previous settings restored anytime. Capture the entire contents of a window with scrollbars as a single bitmap. Great for taking snapshots of web pages that are too big to see all at once. Click on and point to the window you'd like to capture. Great for making web page thumbnails like the one on the right. Extensive use of context sensitive menus to simplify tasks and save time. See a thumbnail list of clipboards. 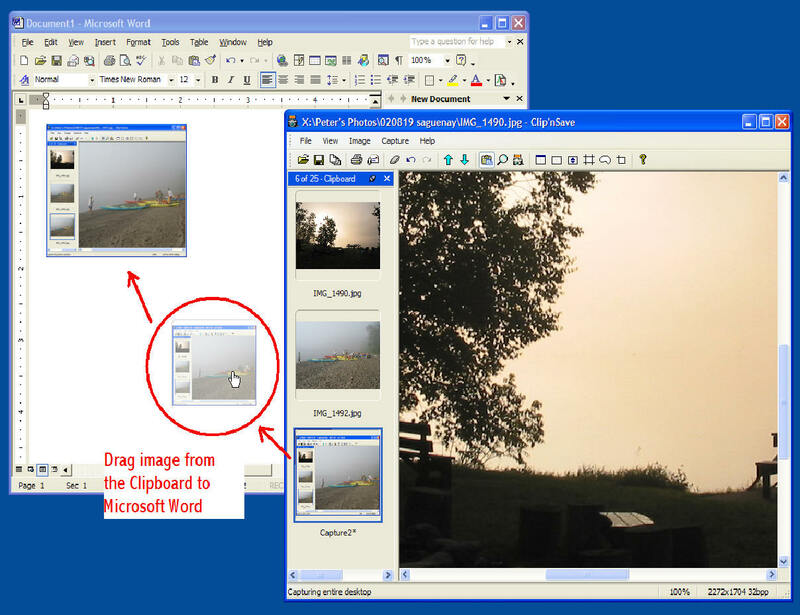 Clip'nSave maintains a list of each image or text object placed on the Windows Clipboard by any application. Simply click on any object in the Clipboard List (the thumbnail pane on the left in the illustration) to make it the active Windows Clipboard. Includes limited support for non-bitmap Clipboard formats, such as text and metafile. Virtually all operations can be undone or redone as required. Drag images or text from the Clipboard list to any application able to paste. For instance, use Clip'nSave to capture a series of images, then drag them into MS Word as needed. As always, you can drag images from the Windows Explorer and other Shell applications onto Clip'nSave to quickly view and place them on the Clipboard. On the right is an example of a Clipboard being dragged into Microsoft Word (the ghost thumbnail being dragged is outlined in red). Select a group of files and apply effects or convert formats. This is great for creating reduced resolution files of digital photographs for web posting or creating thumbnails. Combined with the AutoScroll capture, this is a great way to send copies of web pages to friends and colleagues. Images may be sent via email in several different formats, including PNG, JPEG, TIFF and GIF. 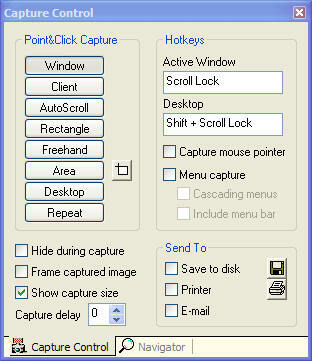 The Clip'nSave Capture menu is available on every application's Window Menu, even if Clip'nSave is hidden (minimized). This way, you can launch a capture from its own application, avoiding delays caused by screen updating. It's also much easier than looking around the desktop or task bar for your capture program. Capture images on any monitor or across multiple monitors. The mousewheel scrolls the Clipboard List or the main window. Shift-mousewheel scrolls left-right and Control-mousewheel zooms in and out. Use the number-pad plus and minus keys to zoom in and out. Numerous image processing effects. 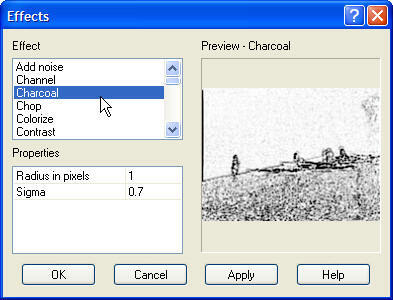 Since applying effects to large images may take a long time, the user has the option to abort them. See how your image is going to print. Many functions, including most screen capture, are available at the click of a mouse button. Supports the latest Windows XP dialogs with additional File Open preview. 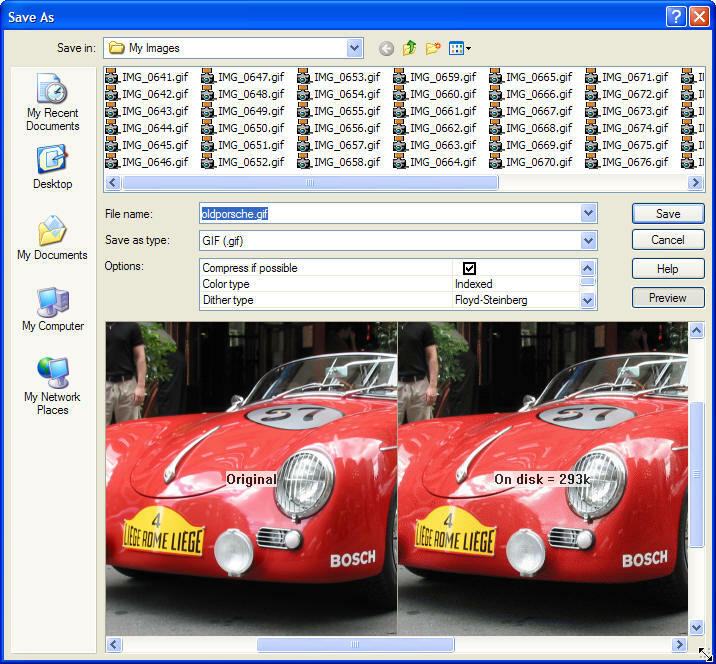 Reads and writes most common bitmap formats, including GIF, JPEG, PNG and TIFF. All capture options are accessible in one place. Hotkeys are easily set by selecting one of the hotkey edit controls and pressing the key combination desired. Take full advantage of Pentium architecture. Dithering (XP/7/Server 200x) and palette support dramatically improves display quality, even on zoomed TrueColor displays. 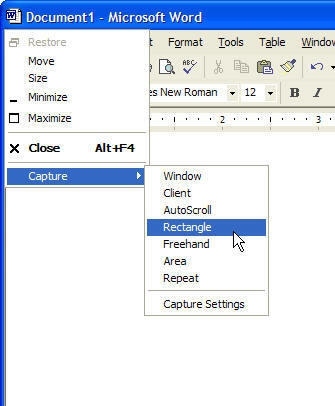 Ever need to adjust a capture rectangle one pixel at a time? Now it's easy: just use the arrow keys to nudge the cursor one pixel at a time. Please complete this form to purchase Clip'nSave. All fields are mandatory - in particular we need your email address to know where to send your activation key. Pressing the "Buy Now" button will transfer you to Paypal's secure payment portal where you can pay either by Paypal or your preferred credit card. Dynalink provides a full range of consulting and programming services for all versions of Microsoft Windows, both desktop and server. We specialize in developing high performance, industrial strength software, particularly legacy and .NET controls, device drivers and real-time automation projects. We have experts available with over 30 years of experience in all aspects of software design, development, commercialization and support. Give us a call to see how we can help you. We also develop customized versions of Clip'nSave to fulfill unusual customer requirements. If you need a particular feature, or would like a control based on certain aspects of Clip'nSave, please let us know. Dynalink Technologies Incorporated is a Canadian company specializing in Microsoft Windows product development and consulting. 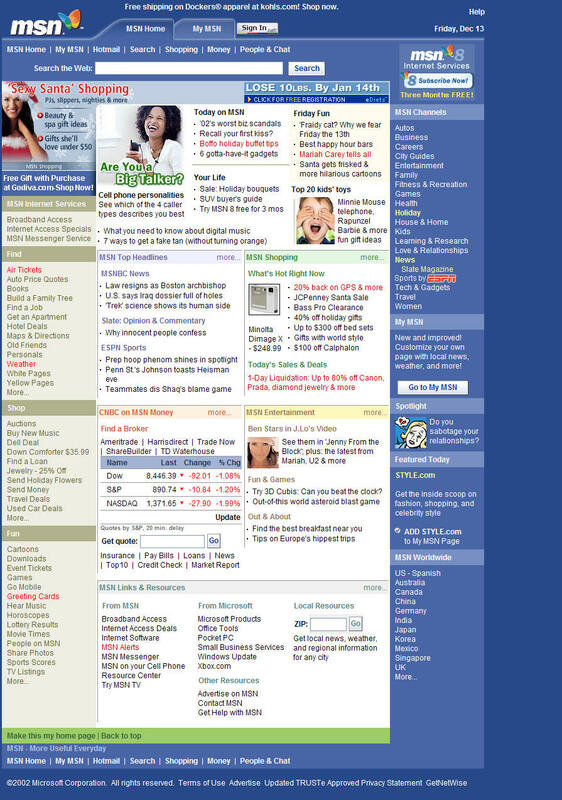 Dynalink was founded in February 1990 by Denis Gilbert, a former software manager for Hewlett Packard. and director of software for Alis Incorporated. He was joined in the firm shortly after by Peter Krnjevic, former president of Trilog Incorporated. Dynalink currently employs 7 people in development and support roles. We contract our marketing, manufacturing and distribution work to several companies around Montreal and in the United States. Our clients include many Fortune 500 companies. Some of our larger accounts are IBM, Exxon, Mobil, AT&T, Prudential, Microsoft, and Chevron. We take pride in our products and try to engineer them well. We sincerely hope that you will enjoy using Clip'nSave.